Juanita Y. Alvarez was born on February 17, 1930 in Thermal, CA to Marciano and Antonia Duran and was raised by Manuel and Eduvijes Yruegas. She was brought up in an Apostolic home and gave her life to Christ at the young age of 16. She graduated from Coachella Valley High School in 1949 and resided in the Valley for over 60 years. She was married to the love of her life, Vicente Alvarez, on April 19, 1953. Together they had 5 children (Vincent II, Steven, Elisa, Richard and Lucita), and were blessed with the honor of raising 2 additional daughters (June and Esperanza). They were devoted to spreading the Gospel throughout the Coachella Valley and devoted 56 years to Pastorship throughout churches in California and Idaho. Their love of 66 years was exemplary in every way. She was a woman of many traits and talents. She loved to sing to the Lord, play the guitar, drive in her Model-A and cheer on her beloved Dodgers. Juanita loved the Lord with all of her heart, was a true worshipper and was proud of her Apostolic heritage. On March 24, 2019, Juanita was called to be with the Lord. She gave unconditionally, worked effortlessly and always demonstrated her love for her family and others. She is survived by her husband, 7 children, 13 grandchildren, and 24 great grandchildren. It is an honor to call her wife, mom and grandmother. To send flowers or a remembrance gift to the family of Juanita Y. Alvarez, please visit our Tribute Store. 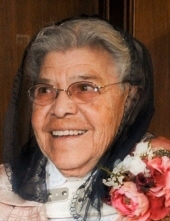 "Email Address" would like to share the life celebration of Juanita Y. Alvarez. Click on the "link" to go to share a favorite memory or leave a condolence message for the family.